Right-click the column heading to the right of where you want to put the Indicators column. Click Insert Column, and then click Indicators. Tip: If you’re not sure what an indicator means, rest the pointer over it. A box pops up to explain it. For a more technical look at indicators, including a list of them, see Indicators fields. Don’t forget that indicators only show status; they don’t control it. In fact, you can’t change the indicators in the Indicators column directly. If an indicator doesn’t seem right, look for the underlying cause. For example, if the complete indicator shows up next to a task you know isn’t finished, check to see if the task has accidentally been marked as 100% complete. If you’d rather not see the indicators at all, you can hide the column: Right-click the column heading and then click Hide Column. Click Project > Custom Fields. Choose an unused text field, and then click Rename. Type Progress (or whatever name you want) and click OK. Under Custom attributes, click Lookup. In the table, add the values you want. For our example, type On track, Behind schedule, and Blocked. 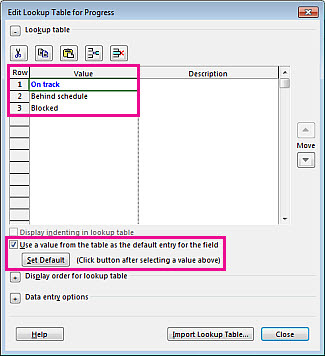 Select the Use a value from the table as the default entry for the field check box. Click the first value (On track), clickSet Default, and then click Close. 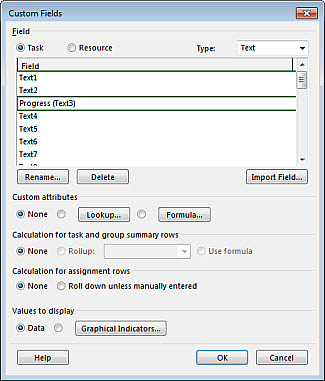 Back in the Custom Fields dialog box, under Values to display, click Graphical Indicators. In the Test for ‘Progress’ column, pick equals. In the Value(s) column, add the value name you set earlier (On track, Behind schedule, and Blocked). Click OK twice to go back to the Gantt Chart. Right-click the column heading to the right of where you want to put the custom Progress column. 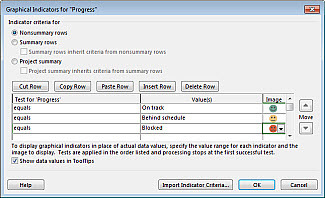 Click Insert Column, and then pick Progress from the list. Pick a progress status for each task.